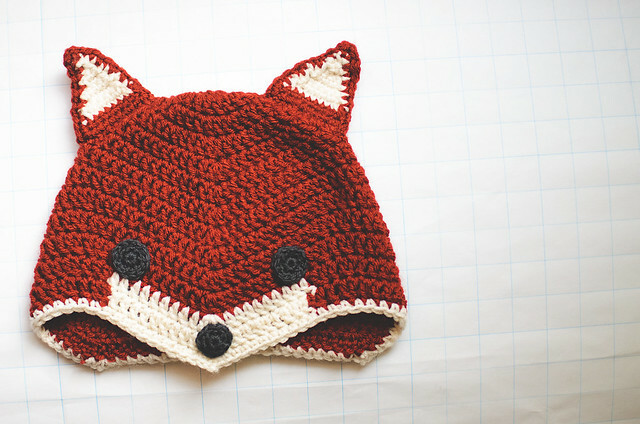 What a brilliant fox hat, it’s the best one I’ve ever seen! Thank you for sharing the pattern, I’m on a hat craze at the moment so it’s perfect timing. I went ahead and worked the hat to fit myself and I had to increase hook size (to the 5.5mm–I) and then I worked 2 extra repeats of round 9 before rounds 10-11 (which are Round 9 with color work). It fits past my ears, now. It might be a little long, so try it on as you work those last rounds to see if maybe you don’t need to make as many. I didn’t make the face or ears, but I think they’d be alright if you worked them as-is. Sorry i missed that above haha. Thank you! I will let you know! Love the hat, thank you for sharing. I’m agreeing with Jill, I’m also on a hat craze. do have this in a knit pattern? love the hat; don’t crochet. I do not, but there is this baby hat pattern that has similar shaping: http://www.ravelry.com/patterns/library/norwegian-sweet-baby-cap—djevellue You will have to make some adjustments to get a bigger size! You also might want to change the crown decreases to be more round than pointy. This is such a cute hat thank you for sharing it. The pictures of your little boy are adorable. I have crocheted quite a bit, but what is a magic circle? A magic circle is a way to tighten the beginning so there is not a hole in the top of the hat. I do it by leaving a tail of about 6 inches, making a slip knot loop, chaining 4 and slip stitch into the first chain made so that you have a small circle. As you work your first row in the center of the ring, be sure to hold the tail of the yarn across the chain so that it is caught in your work for the first row. After that row is complete, you can gently pull on the tail and it will draw up the circle and close it. I love this…seriously. 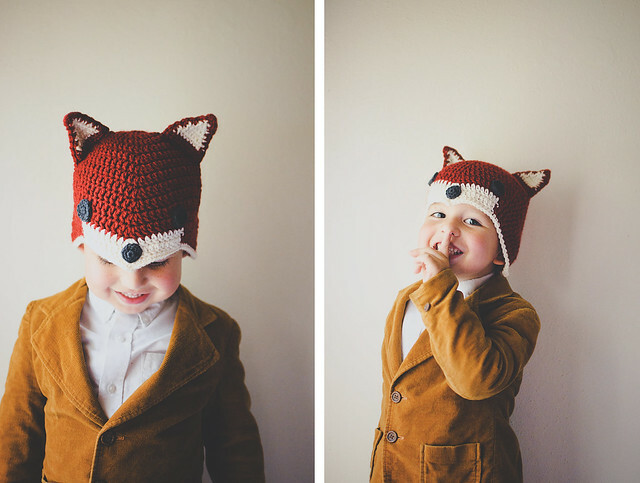 This is one of the cutest crochet patterns I have ever seen. I am FBing this!!! My friend made this hat for my granddaughter and it is so adorable. I may make these for children in the crisis center. I’m sure they would love them. Splendid!! Cannot wait to make this one. Hi! I finally finished the hat! It came out great and I love it! here is a picture of me in the hat. Hey! It looks really great! Any tips on reducing the size to fit a 2 year old? Aside from decreasing hook and/or yarn size, my [untested] suggestion would be to stop increasing after Round 7 (66 stitches) and then go to round 9, but change EVERY “DC in next 9 sts” to “DC in next 8 sts.” Round 9 has increases and decreases that even itself out. They’re placed in certain spots in the round, so change the 9 to 8 to make sure they’re in the same general position as the original pattern. Good luck! Let me know how it goes, please! I’d also like suggestions on reducing the size. 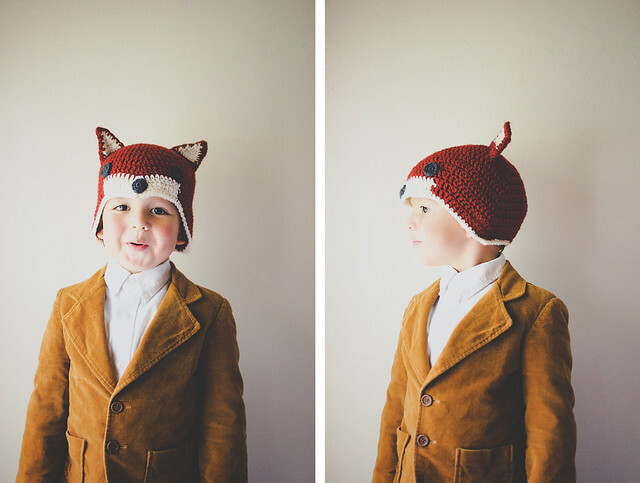 My 2 year old boy is called Fox – this would be perfect!!! I’m having trouble with Round 9 of the hat. When I count up all the stitches for R9 I am getting 77 not 72. Has there been a correction for this part? That’s wonderful to hear! I saw your message via my phone and was going to reply on my computer, but then it had to install updates and restarted on me! One thing led to another and I forgot. So sorry, but I’m glad you got it sorted out! I don’t have a listing for this hat, but I could make one. It would be $28 + $4 shipping in the US. Outside the US, you will have to send me the country/postal code, so I can look up shipping rates. Let me know via email (lisa @goodknits.com) if this is OK! Also, do you want these colors or something more orange? 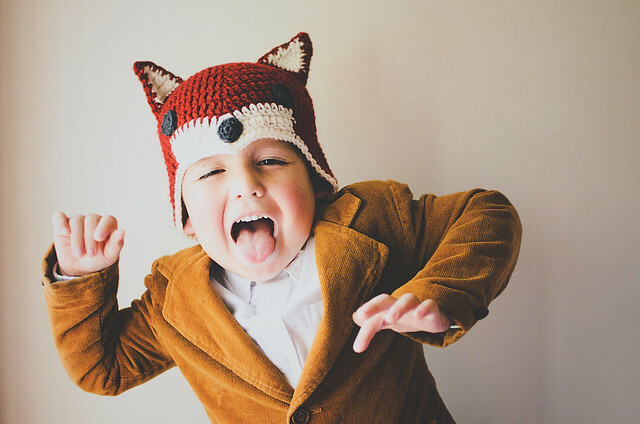 I’m so excited about this, my three year old just became obsessed with what does the Fox say and although I’m losing my mind having to watch it all the time he is going to love this! Thank you so much for sharing your pattern. I made one for my two year old grandson. Used a 4.5mm hook and it fit perfectly. He put it on and hasn’t taken it off since. Hi I was wondering what you’d do for a 7 month size? Any suggestions?? Aside from decreasing hook and/or yarn size, my [untested] suggestion would be to stop increasing after Round 7 (66 stitches) and then go to round 9, but change EVERY “DC in next 9 sts” to “DC in next 8 sts.” Round 9 has increases and decreases that even itself out. They’re placed in certain spots in the round, so change the 9 to 8 to make sure they’re in the same general position as the original pattern. If that is still looking too big, you can stop at Round 6 (60 stitches) and change that Round 9 to “DC in next 7 sts.” AND, you may need to make less Rounds after your new Round 9. Just go until it looks to be the right height for him. It should fit over his ears. Ok so I love this hat and I just finished one using the pattern you so generously provided. I thought I followed it to a T but my seam were the increase is down the middle is not straight down the middle. It wraps around at an angle kind of. Not sure how I can post a picture so you can see what I’m talking about. Have any ideas of what I could have done wrong?? Something must have gone wrong in one of your rows! All increases are made in the center stitch of the increase of the previous round. this is lovely, thank you so much for sharing. I’ve pinned your pattern to share with even more people. I love this pattern, so cute! I discovered this a couple days after it was posted and jumped right on making one for my 1 year old. I used a G hook for the entire hat and it fit him perfectly! I still consider myself a beginner, but this tutorial was excellent and easy to follow. Thanks so much! Any suggestions on getting the ears even? Mine are a bit off after 3attempts! I think tilt still look cute on a 1yr old! This is an awesome pattern, but I’m having trouble attaching the ears so they stand up. I’m pretty inexperienced at joining and wondering if you have any tips on the method you used. I crocheted mine using an I hook for a larger hat. Stacey, Isn’t this a fun pattern? I’ve made it twice in the last couple of days. To get the ears to stand up, this has worked for me. When you sew the front and back of the ear pieces together, do not close the bottom side. Then when you go to attach the ears to the cap, you can sew the front and back on separately, just a stitch apart. Makes a little teepee that stands up nicely. Hope that helps. I was wondering if you could give me the measurements of the hat your made for your son? I’m trying to figure out if it would match up to my kiddo’s head or not so I can figure out if I need to go down a hook size or not. Hi! I’m sorry I didn’t reply sooner! Laying flat, unstretched with the face up, it’s about 10.25″ across. Doubled, that would be about 20-21″ circumference. The fabric will have some stretch, so it could accommodate even bigger noggins. Lisa, Thanks so much for sharing this pattern. I’ve made it twice with worsted wt yarn. First time with an I hook, turned out adult size; second with a G (following same instructions) turned out child size. I’m going to try it with DK/sport wt next to go for baby size. I’ll probably stop the increases a row early. Free patterns off the internet are sometimes great, like your, and sometimes have errors or hard to figure out instructions. Yours are perfect! I did make one change. For the nose, after the first 6 sc, instead of 2 sc in each stitch around, I just did one. This gave me a nice 3D button nose. Thanks again. Your son is adorable and he looks like Mr. Personality, too. 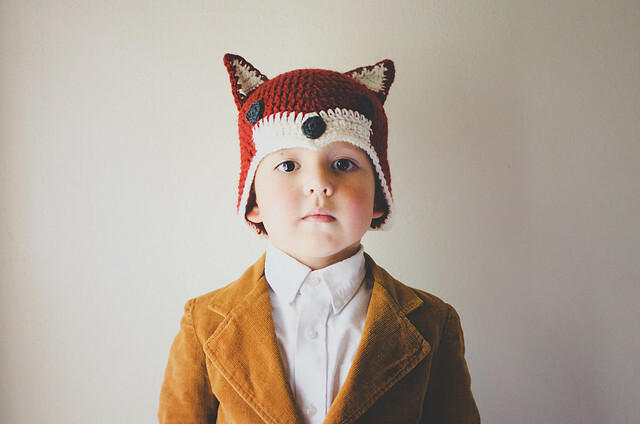 How would I make this hat if I only wanted the point in the front but not the slants around the ears? I just want to make it a beanie with a point in the front. That’s a whole different pattern. The points are created with increases, so you would have to create a pattern with an increase at the front and a decrease to balance it out. Thank you got sharing this pattern. My 4 1/2 yo was excited when I completed the ca. he couldn’t wait to put it on and head outside to play while wearing it. 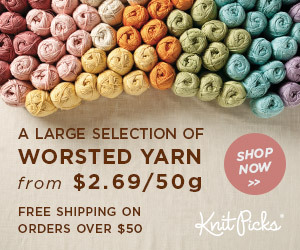 Hi, I am trying to work this in a DK or 8-Ply (Australian Yarns), what would I have to adjust the Hook size to. I will be doing this for a 4 yr old with a head circumference of 20 – 20.5 Inches. Hi there. My son in the photos is 5, so head size is probably not off by much. You can probably go down to a 4mm hook safely. If it looks too small at Round 9, though, you might have to employ the increasing instruction I put in the pattern. Good luck! I can’t wait to make this. Thanks for sharing your beautiful designs. Thank you for the pattern I am going to be starting this pattern very soon. My daycare is wanting me to make them for all the kids because they are obsessed with the song and know all the words! I love the hat, it is awesome. Would you consider doing a tutorial on it? I’m so excited to spin this out today for my son. Thank you for sharing the pattern! I will be posting a picture promptly after.